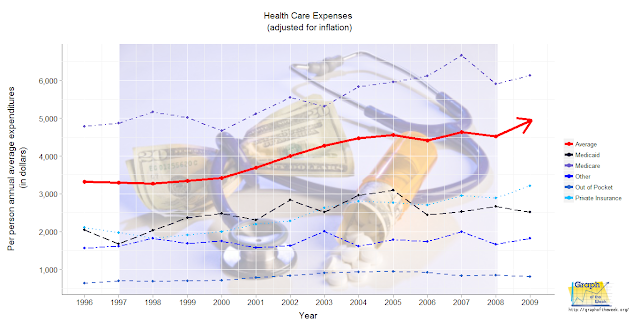 Graph of the Week: Health Care Costs - Part 1, "The Problem"
Health Care Costs - Part 1, "The Problem"
In the United States, health care costs have been going up for a number of years, even when adjusted for inflation. Not unlike a runaway freight train, this rampant inflation cannot continue indefinitely without crashing. "Health is a state of complete physical, mental and social well-being and not merely the absence of disease or infirmity." "Indeed, the WHO definition is 'honored in repetition, rarely in application.'" So, even when 'health' (as defined here) is only applied in a narrow scope, the costs are still increasing quickly - and outpacing inflation (otherwise the lines above would be flat). Practically speaking, there is no way the above situation can occur as no business can survive if priced out of existence. However, it illuminates the problem and provides a time frame in which it must be solved. Bottom line: we're on the clock to solve this burgeoning crisis. "Today, it's very expensive to receive care from highly trained professionals. Without the largesse of well-heeled employers and governments that are willing to pay for much of it, most health care would be inaccessible to most of us." 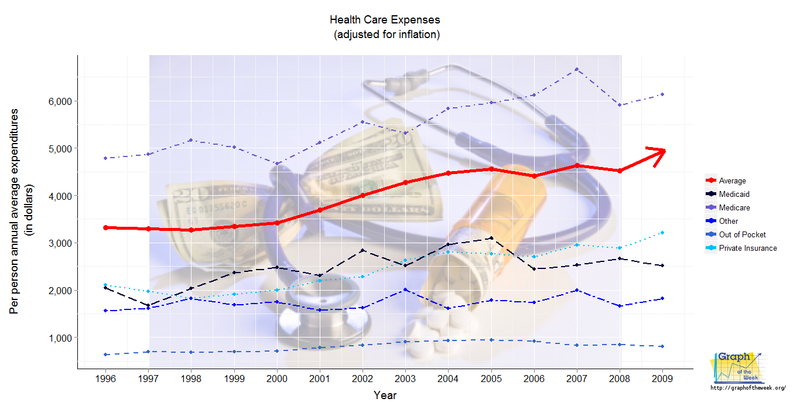 Clearly, health care costs are on the rise; perhaps we are on the verge of a vicious cycle. Historically speaking, this isn't the first time health care has been addressed. Beliefs range from total government healthcare to total private health care and all points in between. Regardless of where a person stands philosophically, the reality is that health care in the United States is getting out of control. In this series of articles, we'll explore both the factors and non-factors in this phenomenon and hopefully some shed some light on this complicated topic. 1) What other solutions have been provided to reverse the rising trend of health care? 2) How long can the above trend continue if nothing changes - 2025? 3) Is our national weight gain problem a factor? These graphs were generated using the 'ggplot2' and 'maps' packages within the R programming language. Additional graphics were created/edited using GIMP. Labels: Health, Politics, R, U.S. Copyright © 2011-2013 Graph of the Week.. All Rights Reserved. Simple theme. Powered by Blogger.